The New Democratic Party (NDP) would spend the $100 million a year they expect to get from a speculation tax on social housing. That’s what NDP MLA David Eby told a packed town hall meeting at the Carnegie Theatre on December 14th. 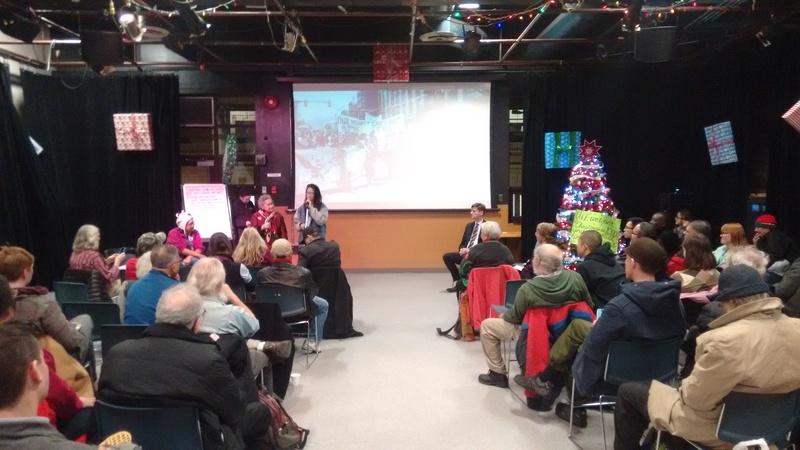 The town hall was organized by the Our Homes Can’t Wait group to call attention to the growing DTES housing crisis. $100 million would pay for about 500 units of social housing on city owned land, far short of the 3000 new units that the BC Non Profit Housing Association says Metro Vancouver needs every year just to deal with a growing population. It is also far short of the 10,000 social housing units a year across BC the Alliance Against Displacement estimates that the government need to build, and the Downtown Eastside needs 5000 units just to house the people currently homeless and living in SRO hotels. Co-chaired by Gallery Gachet and VANDU activist Karen Ward and WAHRS president Tracey Morrison, the town hall featured presentations by DTES residents about various aspects of the housing crisis and questions to MLAs Melanie Mark (who had to leave early) and Dave Eby. When asked how many units the NDP would build, Eby said an NDP government would restore the homeless count and and commit to ending homelessness. “You’ll see specific numbers,” he said. When asked about fixed term tenancies by the SRO Collaborative’s Wendy Pedersen, Eby said “We’re on the record all over the place saying we’ll end it.” Fixed term tenancies are agreements that landlords get tenants to sign saying that their tenancy will end on a certain date. If the tenant signs, as they often do, because they are desperate to find a place to rent, then they can be evicted for no reason and their rent can be increased by any amount at the end of the tenancy. This is happening now in the DTES at the Ross House, for example, and in some Sahota-owned hotels. When asked if the NDP would endorse tent cities by homeless tenter Daniel Isadore, Eby said no. “The NDP supports shelters where people are treated with dignity and won’t be supporting tent cities because we’ll be supporting housing.” Eby wasn’t concrete when Isadore pressed him about what homeless people are supposed to do in the meantime. “One of the main reasons for the housing crisis is that people don’t have enough income,” Harold Lavender told the group. “The NDP does call for a poverty reduction strategy but is reluctant to commit to a substantial increase in welfare. In the last election they only committed to raising the welfare rate by $20″ Eby replied, committing the Party to a poverty reduction strategy but not a substantial increase in welfare. “We can’t say how much,” he said. At the end of the meeting, Jean Swanson reminded the MLA that his party had committed itself to a $10 a day childcare plan and to a $15 an hour minimum wage. She said low income people are looking for strong commitments to build 10,000 social housing units a year and raise welfare to $1500 a month.